Or, three little maids on their way to school, anyway. 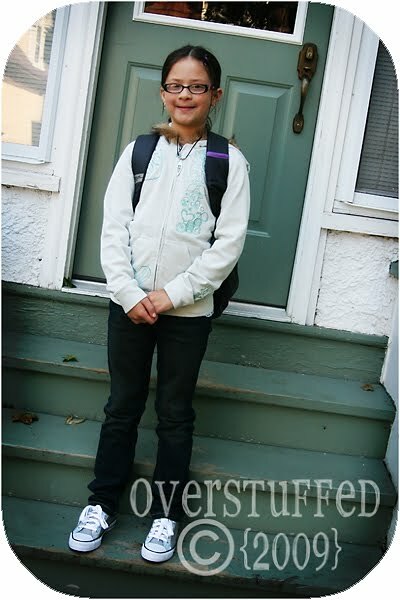 I must warn you, first day of school pictures are my favorite of the year. I love them. 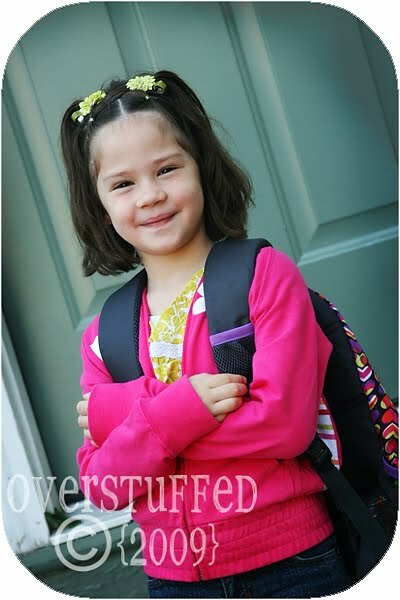 I even love looking at other people's first day of school pictures. And so, obviously, when it comes to my own kids, I especially adore them. Okay, now to the lots of pictures part. 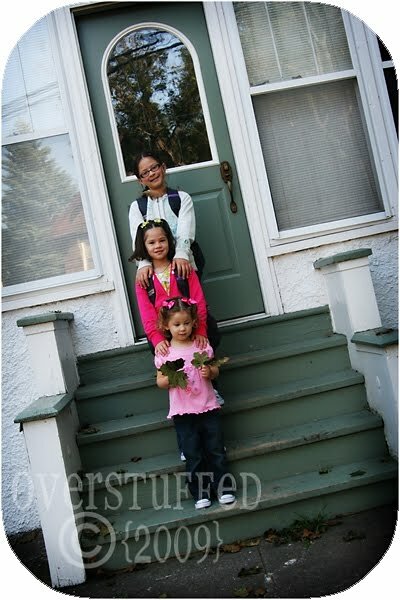 All three girls ready to go on the front porch. Full body shot. It was actually quite warm (upper 80's), but both Bria and Chloe had been so excited about wearing their new hoodies that I let them. Chloe has some attitude, too. Just the first-grader variety. Sophia. 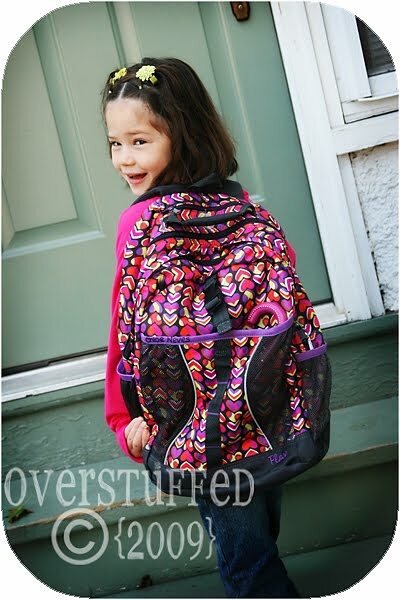 She doesn't have a backpack for preschool (yet). But she does have plenty of leaves. Cuteriffic! And a fake smile to rival Chloe's. We live about 8 blocks from the elementary school. The girls will be bused, but we decided to take them for the first day. School didn't start until 12:30 pm, so we left the house a little after 12 and it took us nearly a half-hour to get there! Every other parent in town had the same idea, it seems, and the traffic was horrendous! After I got the girls to their respective classes, I took Joel back to his office and then took Sophia to preschool registration. No real class today, just paperwork. I did meet a mom that lives just down the street from me. Get this: She has three daughters. 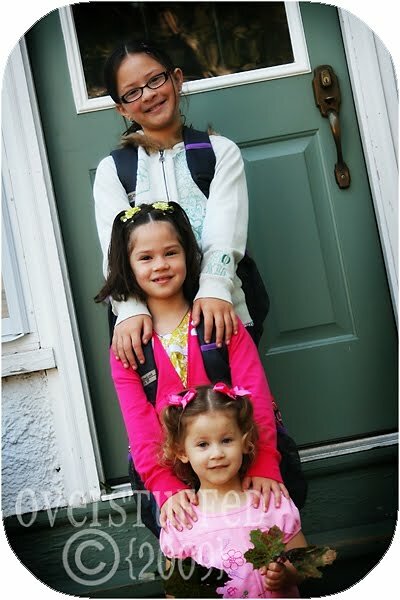 A fourth-grader, a second-grader, and a three-year-old who is in Sophia's class. Her oldest and Bria are also in the same class at school. I'm thinking they're an answer to prayer. And the best part? The bus stop is right in front of their house. ANd first grade attitude is my favorite! thats exciting!! I think it is an answer to your prayers!! :) Your girls have grown soo much!! I remember Sophia when she was a baby! Its amazing how fast time has flown! Thanks for sharing and wishing your girls a GREAT school year! Instant friends are always great! Darling pictures, Lara, and darling girls. And I'm thrilled for you about the friends! I love answers to prayers. They look adorable! We bought Micah the heart backpack too! I liked that it was a bit smaller than the huge ones I have seen everywhere. Hope they like their new school. They look absolutely adorable! The first day of school is always so exciting! Oh, you just made my day! 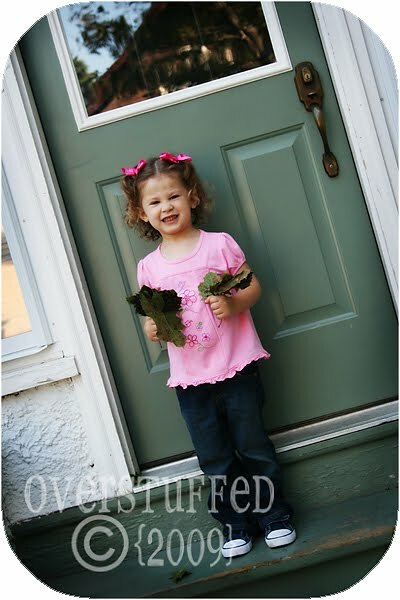 Lovely little ladies, a glimpse of your new house (love that door! ), and a reference to my favorite Gilbert & Sullivan musical, to boot! Sounds like life-long friends are in the making! Your girls are beautiful! That is wild about the other mom with girls about the same age. It is amazing how prayers are answered. I hope that works out to be a great friendship for you. Could they be any cuter? 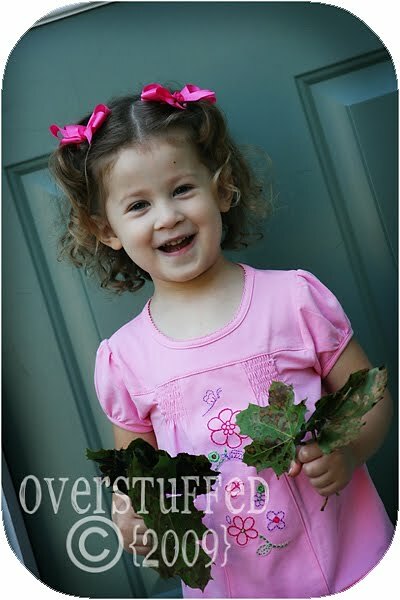 And who doesn't need leaves for pre-school? Perfect! I love Bria's shoes, where are they from? I told you that you would find a friend. God gives us right what we need, right when we need it. Can't wait to hear how the girls are doing in their new schools. Hey! There's another friend for you. You're just rackin' them up! Adorable, ADORABLE pictures! What darling little cuties. Wow that's great!! your kids look so cute! Beautiful photos, beautiful outfits, beautiful front porch, beautiful girls!! Your girls are sooo cute. 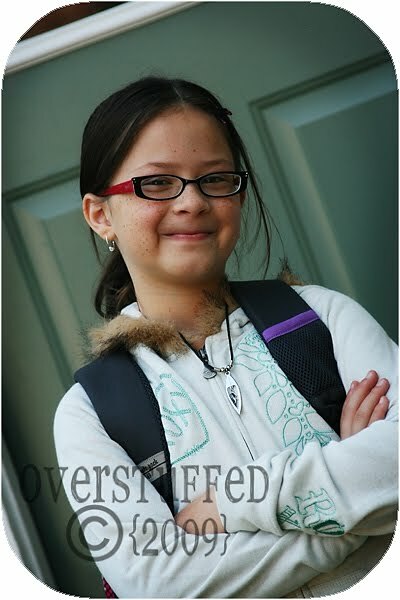 Ryanna has the same backpack as Bria. Should've known if I bought it at TCP I would see it at some point on your blog. First day of school? Ryanna's almost done with first quarter! I am not sure what makes me more jealous, your cruise, or your bus. And those are great first day pictures. Ooh, I can't wait to hear more about this new friend you are making. What an answer to prayers! And your kids look so cute. I hope they had a wonderful first day. All I could think about while looking at those pictures is how much fun you are going to have decorating your front porch and steps. I can just picture all the pumpkins for halloween! You could even get a bale of hay...oh the possibilities! And your girls are adorable! So does school start every day at 12:30 pm??? 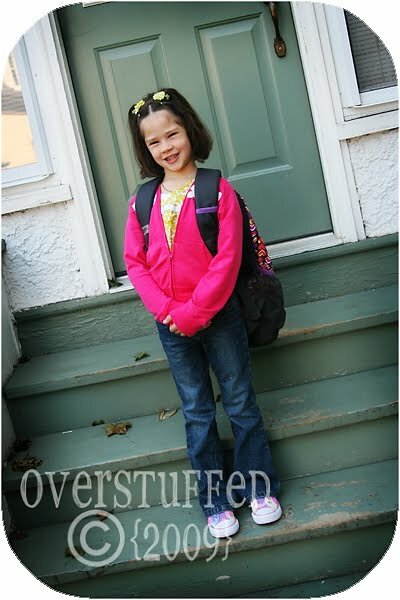 Love the first day of school pictures. Your girls look like they are doing great. Those are so precious! I love first day pics too. Just wish mine looked better, but oh well. Give those girls big kisses from Auntie! muuuuuwaaaa!